'Ripples' to spread to your PC as of July 24. 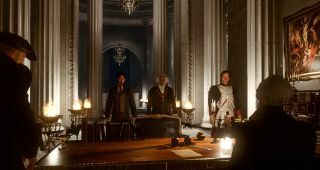 The third episode of neoclassical narrative adventure The Council will arrive on July 24, Focus Home Interactive has announced. Titled “Ripples”, the third episode will continue the story of Louis de Richet, who belongs to an 18th Century secret society whose members include George Washington and Napoleon Bonaparte. Its heavy emphasis on dialogue and player-choice is similar to DontNod’s Life is Strange, only with less teenage angst and more powdered wigs. Alongside its heavily caricatured look, The Council aims to stand out through is “Social Influence” system, a complex network of skills and abilities more in-line with an open-world RPG than a tightly scripted adventure game. Using this system, Richet can attempt to manipulate other members of the society as he investigates the fate of his mother, who vanished somewhere inside the society’s island mansion at the game’s commencement. According to the publisher, the already tense atmosphere of the council will grow more unstable as “Plots are laid bare, characters reach their breaking point, and an unexpected, terrifying truth is uncovered.” Hopefully the third episode will also address the quality of the voice-acting. Focus Home also released three new images showing off The Council’s third episode, which you can view below.